Will we have any unexpected costs added while building our home? Lancia Homes believes in not hiding any costs or expenses. When you sign a building construction agreement, we will outline the exact costs and allowances (if any). If you add any options while the home is under construction, we will create a change work order that spells out the additional costs. Both the homeowner and Lancia sign the work order. Surprises are fun for birthdays, not home building. See our stages of building! Why does my Lancia home have a bath fan on? Your Lancia home is equipped with fans in all the baths to circulate moist air. Lancia installs a fan in the Main Bath that runs continuously to bring in fresh air. A healthy home has a return air exchange, but is also built tight to prevent drafts. We are also one of the few builders that have cold air return vents in the Bedrooms, many builders eliminate this to save money. Who do I request fence approval from? If a subdivision is held and owned by Lancia then any fence, swingset, pool, structure approval needs to be sent into the Lancia office to the Architectural Committee. Fences must start at the back rear corners of the home and pond lots have their own requirements. When a subdivision is almost completed it is turned over to the homeowners in a homeowners meeting and an Architectural committee is formed from homeowners. Covenants are located under Communities on our website. Where does Lancia Homes build? Lancia Homes builds throughout northeast Indiana and the northwest edge of Ohio. Our building radius is approximately an hour's drive from the Allen County Memorial Coliseum. Contact us if the location is slightly over an hour; we can build outside that area on a case-by-case basis. Where can I see past Lancia HBA Parade of Home pictures? Under the "Galleries" Photo Gallery section of the webpage. Look to these Parade homes for upgrade ideas! What is the Special Financing Program called the USDA program for buying a home? You can buy a new home with these 2 USDA government programs thru Pathfinders. The programs have been around for many, many years and they are not Special Programs thru any specific builder. • Single Family Housing Guaranteed Loan Program; What does this program do? • Single Family Housing 502 Direct Home Loans; What does this program do? Are these programs open to any builder? YES! Lancia does work with Pathfinders on building new homes thru these program. We have build many homes for years thru these programs. What is included in a Windsor Collection home? What is included in a Marian Collection home? What if we have something special we want Lancia to create? Call 260-489-4433 and ask! Lancia is a custom builder and your only limitation is your imagination! What if my main concern in building a new home is Energy Savings? Lancia is always working to be first in the area with the best version in Energy Savings for your new home. Lancia uses products and companies who also promote a tight and healthy home for you with the lowest possible Energy costs. What if I'm looking for something unique or if I require special needs features? Your only limitation is your imagination! Check out the "GALLERIES" tab of the webpage for custom sample pictures. If you don't see a floorplan with the amount of rooms you desire that would be considered a custom build needing only to meet your finance and the building code requirements. Lancia builds handicap accessible, special needs or easy access homes. Call 260-489-4433 and ask! What if I'm looking for a 2 Bedroom or more than 4 Bedroom's? Lancia Homes is a custom builder and since 1975 has been building homes with 2 Bedrooms to 6 Bedrooms and beyond to fit family needs. A home with a Den for instance could, with a closet added and the doorway altered, be turned into another Bedroom. Looking for a home with two Master Bedroom's? Adding footage to a 2nd bedroom in the back of a ranch can be developed into another Master Bedroom. If you don't see a floorplan with the amount of rooms you desire that would be considered a custom build. Your only limitation is your imagination. What does the base price of the home include? Lancia’s base price provides a total home package. Each home series has different standard features, but includes all painting, flooring, cabinets and fixtures. At closing, your new home will be ready for move-in. Lancia’s base price does not include the lot/land, site development or additional options. For a complete list of included features in each of Lancia's home series, check our Comparison Brochure. We're moving to Fort Wayne from out of state, but we want to build. How does that work? It is helpful if you can come to Fort Wayne to sign the necessary paperwork and make your selections. We can do all of this in one visit to our office. However, we have built homes for people who can’t make regular trips to Fort Wayne. We use electronic communication and mail to stay in touch. Call our office at (260) 489-4433 for more information or visit the Contact Us section of our web site. How long has Lancia Homes been in business? Jim Lancia started building homes in Fort Wayne in 1975. He and his son Jamie have been building throughout northeast Indiana and far northwest Ohio ever since. 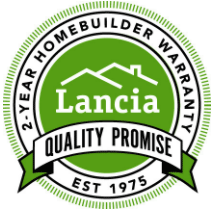 In that time, Lancia Homes has developed relationships with suppliers, vendors and subcontractors to give you the best home at the best possible price. The average construction time to build a home on a slab foundation is approximately 150-165 days. A home on a basement takes about 165-210 days. Obviously weather can postpone construction as can other events, but we make every attempt to minimize the effects of such delays. Lancia does have available homes under construction or ready for move-in; check out the Homes For Sale section of our web site for a complete list. How do the 2 Standard Series Compare to each other? Does Lancia Homes build custom homes? Yes. Lancia is happy to give you a quote for a floor plan you have or work with you to create a unique plan of your own. Lancia has built custom homes from 1,400 square feet to more than 6,500 square feet, including lake cottages. Even our floorplans shown online are modified the majority of the time to fit the homeowner style. Call our office at (260) 489-4433 or visit any model center for more information. Does Lancia build on acreage? Yes. Lancia Homes has plenty of experience building on rural acreage so we understand the needs of these homes and properties, including well and septic permits and installations. We have a construction supervisor dedicated to these county jobs. Visit any model center or call our office at (260) 489-4433 for more information. Do you have completed homes that are move-in ready? Yes! Visit the Homes for Sale section of our web site for a list of speculation homes. We have a range of prices, styles and locations available. Depending on how far along the construction is, you may even be able to pick some selections. Or choose a home that's finished, ready for you now. Do you build outside of Lancia communities? Absolutely! Lancia builds both in our subdivisions and multi-builder communities or rural acreage. If you have a lot or acreage, give us a call at (260) 489-4433, visit a model center or open house. Can we make changes to one of Lancia's plans? Yes. Because Lancia's homes are stick built, it gives you the flexibility to customize a floor plan to meet your needs. We can make rooms bigger, add features or almost anything possible. Nearly all of our homes are customized specifically for our homeowners. Can I use my Ft Wayne St. Vincent de Paul School Reward Program at Lancia? Yes! The form from Ft Wayne St. Vincent de Paul School Reward Program needs to be presented at the time of contract signing. Lancia is helping our community with a 1% donation of the base price of the home price published on our website to St. Vincent de Paul School Reward Program. 50% of that goes toward St. Vincent de Paul School and 50% goes toward the new homeowners choice of a program in the Ft Wayne Diocesan network. Ask your rep! Can I use a REALTOR® to represent me when I purchase a home? Yes. Lancia works with REALTORS® to represent our buyers. You can choose to work with a Lancia REALTOR® or use a real estate professional from another real estate office. In order to purchase and sell real estate all of the Lancia management are REALTORS®. The cost of your home does not change if you work with one of our agents, a cross-office agent, a broker or come directly to the Lancia Homes office. Are my Covenants and Restrictions listed on this website? You will find most current covenants and restrictions listed under our "Community" heading. For any other of our past subdivisions you can contact our office at (260) 489-4433 or thru our "Contact Us" page.